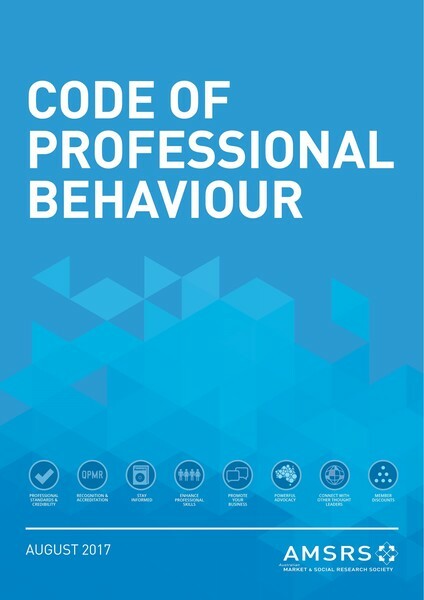 The AMSRS Code of Professional Behaviour (the Code) sets out the basic principles that must guide the actions of those who carry out or use market, social and organisational research. It is designed as a framework for self-regulation and provides the public, government and business community with the assurances needed to encourage informed and willing participation in market and social research. Individual members of the Australian Market and Social Research Society (AMSRS) are bound by the Code which covers both the ethical requirements and standard conditions of conducting and reporting market and social research. It is the responsibility of members to keep themselves updated on the Code. Our toll-free Ethics Line (1300 661 951) is available for AMSRS members to call for assistance with their ethical enquires. Our Ethics Officers and our Professional Standards Officer, Jane Gregory (psofficer@amsrs.com.au) is on hand to answer any questions about the new Code. the Rules are clear and easily understood by members. To access a PDF copy of the latest version (launched 7th August 2017) of the Code, or click on the image of the Code above. A Guide explaining the changes is available here. For further clarification on the Code please refer to the AMSRS Guidelines and Fact Sheets located here.